Raavanan, the new Indian film produced in both Hindi and Tamil, premiered at the Tenth Annual Mahindra Indo-American Arts Council (MIAAC) Film Festival in New York City this week and I was on the red carpet meeting the biggest names in Bollywood - and beyond - for the occasion. Abhishek Bachchan and Mani Ratnam during filming of Raavan. 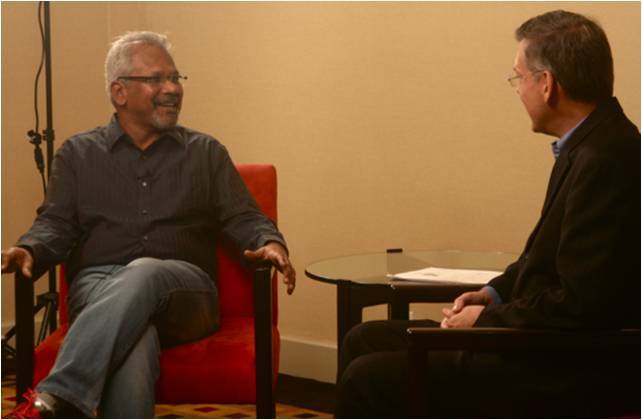 This morning I had the honor of interviewing India's Steven Spielberg - Mani Ratnam, producer of 22 films and married to mega-star and co-writer Suhasini Maniratnam. Time magazine included Mani's 1987 film Nayagan in its All-Time 100 Best Films. We chatted for 30 minutes in the heart of Manhattan about his latest epic film set in the heart of South India's jungle. NYU professor Richard Allen interviews the husband-wife team at the film festival. Based loosely on the incredible Sanskrit two thousand-year old legend of Ramayana - "Rama's Journey" - the film is a metaphor for Modern India, set in the Tamil South. His last film was more low-brow: the low brow hit comedy Guru which many of us saw in-flight in 2007. 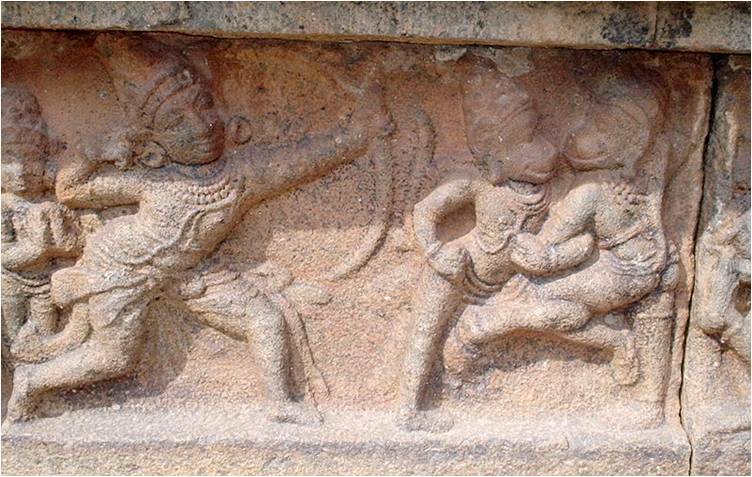 The film is based loosely on Ramayana, seen here in an ancient carving near Chennai. I was fortunate to meet Mani - a man whom many at the opening literally bent down to touch the foot of - because of my friendship with the incredible Aroon Shivdasani, founder of the Indo-American Arts Council (IAAC), who I have covered extensively. Mani is perhaps most revered for mastering the technical details in the art of film making. Our conversation ranged from plot and character to the possibility of India's seat on the U.N. Security Council. From the southern province of Tamil Nadu and holding an MBA, Mani is not your typical Indian film director. But he comes to it naturally: his father and his brother were also film producers. He tried to stake out new territory as a management consultant, but film pulled him back. 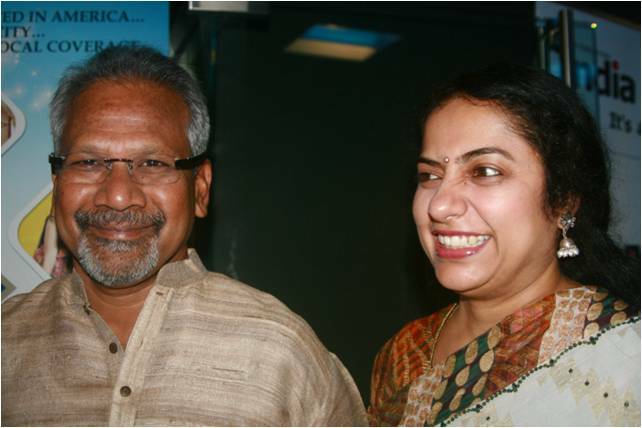 Husband-wife team Mani Ratnam and Suhasini Maniratnam co-wrote the screenplay. 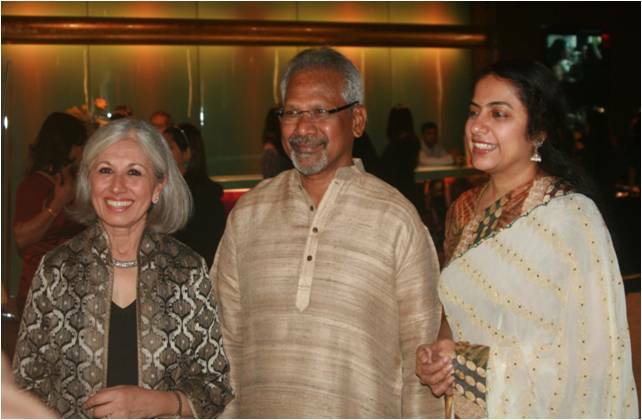 Suhasini Maniratnam, his wife, who was the first female student to graduate from the Madras Film Institute and has starred in almost 100 films, who co-wrote Raavanan with him. A.R. Rahman, the Oscar- and Grammy-winning music composer, wrote the musical score for Raavanan. His participation was made larger by the role of Bollywood-style song and dance in Indian film. He has written he scores of almost 200 Indian movies, including Slumdog Millionaire. MIAAC is proud to represent the diversity of the Indian subcontinent by presenting the Tamil version of Raavanan. 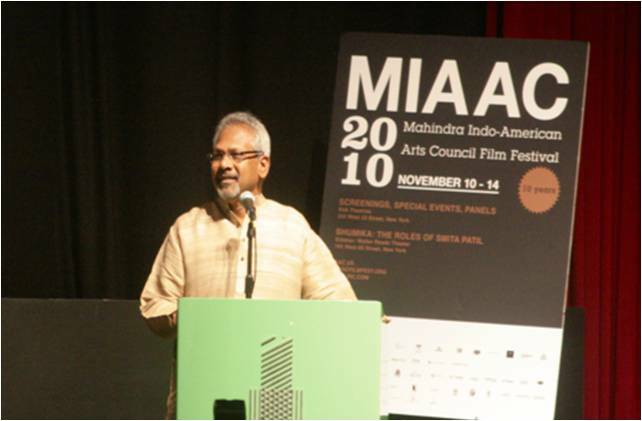 We are thrilled that a man of Mani Ratnam's stature was able to be in our midst to speak about his film and other South Indian cinema to the New York audience. The phenomenal actor Aishwarya Rai and brilliant director Mani Ratnam on location. Perhaps the most intriguing aspect to me about the films' dual release in Tamil and Hindi is that the two works were shot in tandem but differently, with good and evil reversed. Mani explained during our chat that there is good and evil in all of us, in a continuum, and that nothing is entirely black-or-white. In Ramayana, the beautiful Sita, wife of Rama - the incarnation of the Hindu preserver-God Vishnu), is kidnapped by the evil Monkey King Hanuman. Sita, the epitome of female purity and virtue, is played by the breathtakingly gorgeous Aishwarya Rai, one of my favorite actresses. This epic depicts for Indians and indeed the world the duties of relationships, portraying ideal characters such as the ideal servant, the ideal brother, the ideal wife, and the ideal king. The characters Rama, Sita, Lakshmana, Bharata, Hanuman, and Ravana are all fundamental to the cultural consciousness of India. 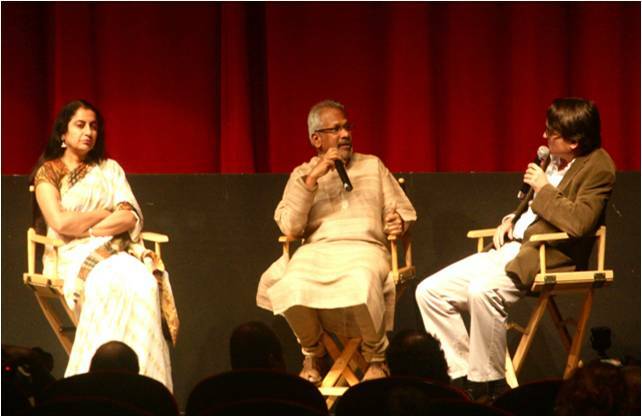 Aroon Shivdasani, founder of the Indo-American Arts Council, with the film's co-writers. In his film Raavanan (called Raavan in Hindi), the villain Veeraiya falls in love with Sita, and the role of Hanuman is played by a ruthless police officer chasing the tribal leader who has kidnapped his wife. The film opens with shots showing Veeraiya (Vikram Kennedy) jumping off a cliff into the water. His gang of thugs are busy distracting the police. Police cars are set ablaze and gang women seduce the police into a trap where they are all murdered. The scenery - the river, mountains, forest - are rivaled only by the cinematography. Meanwhile, the beautiful Aishwarya Rai is off on a boat trip where she gets kidnapped by the bad guy. The pace is so fast and furious it's breathtaking. Ravaan is a natural development out of Ratnam's work up to this point both in its production and story. For some time now Ratnam, a Tamil director, has been making Hindi films, and this reworking of the story of Ravaan from the Ramayana, shot in both Hindi and Tamil, allows him to explore his abiding concerns with social justice and morality, the will to power and redemption through love, on an epic scale. It also showcases Ratnam's remarkable facility with the rich expressive vocabulary of popular Indian cinema which makes him one of the most important directors in world cinema. When we Americans think of Indian film, it is often Slumdog Millionaire and Bollywood, Bollywood, Bollywood. Bollywood is based in Mumbai - "Bombay" - in India's center. High quality films from South India are often not promoted heavily as Bollywood. Raavanan was shot in location in South India in the Kerala Forest in the language of both Southern and Central India (Tamil and Hindi). Interviewing legend Mani Ratman as part of the Tenth Annual MIAA Film Festival. I was so touched to sit knee-to-knee with the living legend Mani Ratman, thought leader and global citizen, and discuss with him so much. Off camera we talked about building the New Haiti, an ambition I am actively involved with, but that story is for later. Simply put, Mani Ratman's Raavanan is The Must-See International Film of 2010. 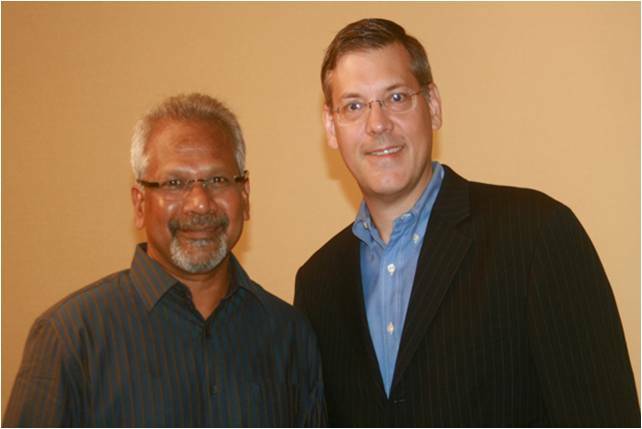 Film producer Mani Ratman with the author in New York.